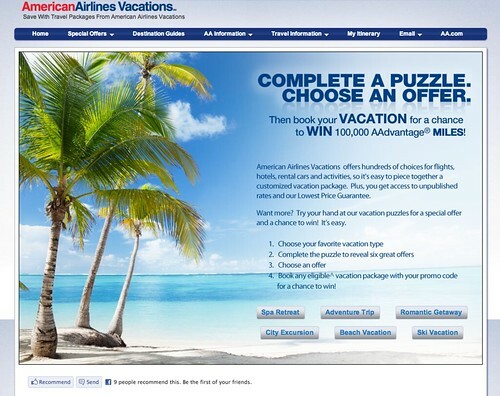 Book your Vacation for a chance to win 100,000 AAdvantage Miles! Can you picture your next vacation? Get inspired when you try your hand at our vacation puzzles. Simply complete a puzzle to reveal a choice of six incredible offers, such as a 10% discount, to use toward your vacation package. Use your promo code to book your spring break trip, summer vacation or a weekend getaway and get a chance to win 100,000 AAdvantage miles — that’s enough for two round-trip tickets anywhere we fly! Enter by Booking: Visit www.aavacations.com/piecetogether and complete a puzzle. Purchase a flight + hotel (or flight + car rental) vacation package with a minimum total package price of $1,250 using the promotion code you receive after finishing your puzzle. Enter Online: No purchase necessary, just complete the form at www.aavacations.com/pieceenter and submit your entry. There is a limit of one entry per person regardless of entry method. If I win, I’m going to Hong Kong. Where will you go? Leave your vacation destination in the comments section for a chance to win a package of the new Marcus Samuelsson spiced nut mix that American started serving late last year. I tried them a couple of weeks ago, and they’re pretty good. If you want to see some photos, check out this review from the Weekly Flyer over at Points, Miles & Martinis. I’ll have a random drawing in the morning and the winner will be announced tomorrow. One entry per person. The deadline to enter is tonight at 11:59PM Pacific. I would go to Istanbul! Thanks for sharing! Probably London and the rest of GB. Gf still hasn’t been. anywhere with a warm beach!